Taking a journey to a new place is thrilling, surely. However, the pragmatism that seeps inside the mind questions the WHY behind it all. There are the obvious reasons: research, opportunity, and excitement. What about that last one? As a fairly conservative student of life until the age of 18, this student has a wondering, winding list of the whys that counter-act the old traditional path of success. While I may judge my expectations of this continent often from a bright-eyed awe of the Africa I do not know, there is the question that surfaces as I ask myself about this journey. Do I have the wanderlust? I am reminded of a wise man’s words who often writes of his journeys and what he sees in the journeys of others: “Not all who wander are lost.” A new twist on wanderlust. So today I began contemplation of the parable of the turtle and the hare. The boastful hare speeds on to win the race as quickly as possible but his arrogance allows him “kip” as the Irish say, while the turtle limps along but ultimately crosses the finish line first. Slow and steady wins the race. While surrounded by the harbour and port of Nacala Vehla today, it was only a few days ago I was in Gaborone watching a giant turtle that slowly made its way around the lodge we were staying at. Red and orange sands made this a dusty, warm destination with not much to do but prepare for a wedding, which was the main reason for Christmas in Botswana. Or you could jump in the swimming pool. Oh there was rhino trekking in the nearby game reserve too! (More like safari driving and a few steps of well-ordered shushing as a small handful of us prodded through desert and tall weed, but save that for another story at another time perhaps.) Botswana is known for its supply of diamonds and is a success story often touted in economic terms for Africa. As for Gaborone, it is a large enough city with its supply of South African imports like the occasional juice stand, sky high hotel, and pricey restaurant, but also houses the wandering cow that meanders across the road to watch you eat your dinner on the evening terrace or cars which blaze horns as a herd of kid goats slowly walks across the pavement for a blade of grass. The juxtaposition is just part of its charm. Being in Botswana reminded me of how fragile life is: it could be gone in an instant, but all the while you are seeing things truly weird and wonderful. (A phrase borrowered from my best friend and partner in crime in Southern Africa.) They say that the paradox with such a love of travel is that the wanderlust makes one so thirsty for a new adventure that you have an insatiable desire for the new. Let’s take this in contrast to the person who never goes far from home. If one never leaves, then it is hard to appreciate or even simply attempt to understand what is foreign and unusual to what is known. However, if one always has the wanderlust, then nothing will ever seem like home. So here lies the traveller, one who wants to learn but remember the familiar and know her way home. The key to this is knowing where you came from and taking those you care for on the journey with you, wherever you go. So today I am reminded that as far as I am from where I started, thousands of miles even, I take a piece of home with me which is why I am grounded (like the turtle) who may not be first, but will cross the finish line when he is ready. 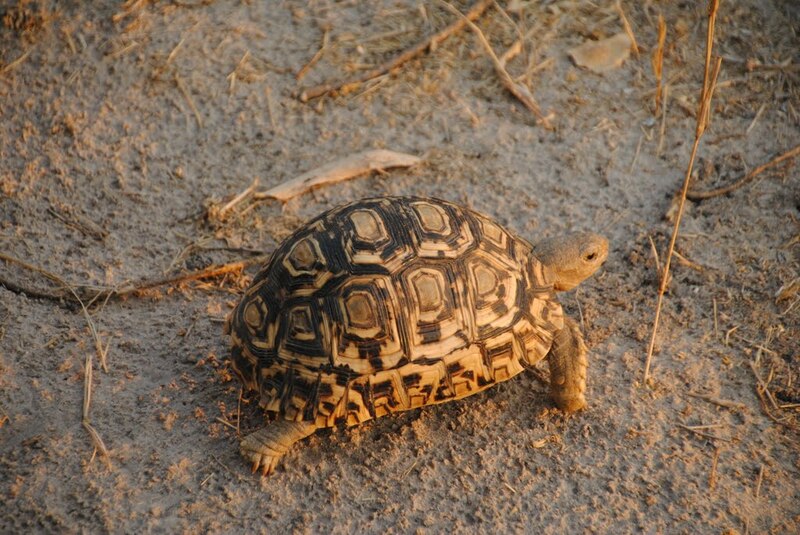 Game Reserve, Botswana, the capture of this leopard turtle was obtained. I knew that quote sounded familiar. Gandalf! I am happy you are enjoying your time there. I cannot wait to visit…AFRICA! Thanks my dear Parisian friend. After Croatia, I’m expecting that there will be a few harrowing stories of your own to share! Rock on.